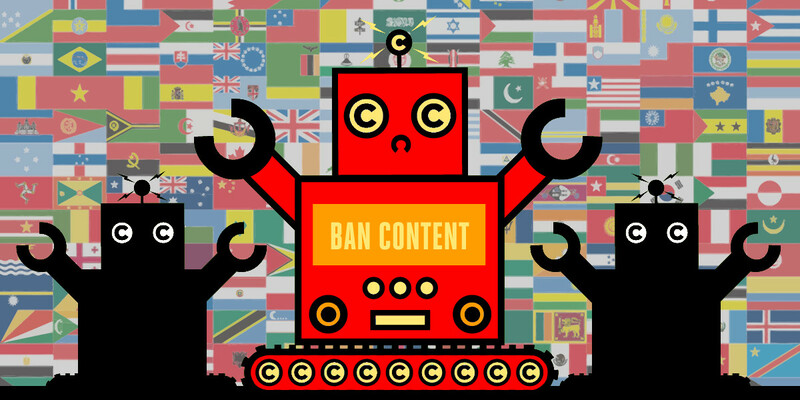 The EU's catastrophic new Copyright Directive is steamrollering towards completion, and that should worry every internet user, not just those in the EU. Article 13 of the Copyright Directive requires online services to crowdsource a database of "copyrighted works" (anyone can add anything to these databases, with no penalties for falsely claiming copyright over public domain works, or works that don't belong to you). If a user tries to post something that appears to match an item in the blacklist database, the service has to censor that user's post. The problem is that the online platforms don't have "European services" and "non-European services," they just have services, and users from the EU and outside of the EU freely mix there, posting material and commenting on it. So if you're Twitter and one of your US users posts something that has to be censored in Europe, you can either censor that just for EU users, or for the whole world. If you do decide to just censor the post in the EU, then you have users in (say) Canada replying to that US post, and now you're showing your EU users the replies to the post, but not the post itself. Indeed, you might get Europeans posting things that can't be displayed in Europe, but which the rest of the world is allowed to see -- do you censor those posts in the EU (including from the people who made them) or in the whole world? To make this all the scarier, the EU rules provide for massive damages if a platform lets a copyrighted work slip through the cracks -- so in the event that a platform isn't sure if a work is going to be shown to a European user, they'd be nuts to take a chance on it. The result will either be a balkanized internet where services host special versions of their conversations for European consumption (much like the censored search engine Google wants to sell to China) or an internet where we race to the bottom, as defined by European copyright extremists.